What is the String Project? The University of Nebraska-Lincoln & Lincoln Public Schools String Project is a joint effort between the Glenn Korff School of Music at the University of Nebraska-Lincoln and Lincoln Public Schools. It is an after-school teacher-training program that gives children the opportunity to begin playing a stringed instrument before they start third/fourth grade, or the equivalent in their school. It also affords the same opportunity to students who are home-schooled or who attend private or parochial schools that may not have string programs, as well as students who live in outlying areas. Classes are held twice weekly for beginning students at Park Middle School–Monday and Wednesday at 4:30 and 5:30 (each student will attend BOTH DAYS at one of these hours). Who are the String Project Teachers? Classes are taught by string students who are pursuing music degrees in the Glenn Korff School of Music at the University of Nebraska-Lincoln. Some already have some teaching experience. A number of former University of Nebraska String Project teachers (the program existed previously from 2000–2006) have been highly successful in finding teaching jobs in the schools in Lincoln, Omaha, Iowa, Missouri, Kansas, Nevada, and Illinois. Others have their own private string studios. Additionally, former University of Nebraska String Project students have gone on to pursue music in college, both as music majors and non-majors. Who is the supervising teacher? The String Project teachers are supervised by Master Teacher Dottie Ladman, a recently retired string specialist with Lincoln Public Schools. Ms. Ladman is highly respected as a music educator throughout Nebraska. Not only has she been an active teacher in LPS for many years, but she continues to perform as principal violist of the Hastings Symphony Orchestra. Dr. Karen Becker, Founding Director of the University of Nebraska/LPS String Project, is Professor of Cello in the Glenn Korff School of Music at UNL. Her interest in the String Project concept comes from having taught for several years in the University of Texas String Project. She studied cello at the University of Texas with Phyllis Young, renowned string pedagogue and former director of the Texas String Project. Each student must provide his/her own instrument; rental is recommended. Student participants should contact one of the local music stores or string shops to inquire about rental fees. Note: if your child qualifies for free and reduced lunch through LPS you must contact Dr. Becker in order to receive the Free/Reduced Lunch Registration Form and pay half of the registration fee and half of the instrument rental (see contact information below). First Year Students (Vivaldi Ensemble): all parents and students of first year students must attend the Orientation meeting taking place on Monday, Sep. 10 at either 4:30 or 5:30PM (whichever time your child is signed for) at Park Middle School. ALL classes (Vivaldi, Mozart, and Beethoven) start on Wednesday, Sep. 12th. Students who enroll must be available to attend classes two days a week: the registration form allows you to indicate whether you are available Monday and Wednesday at either the 4:30-5:20 or 5:30-6:20 class times. NOTE: Mozart Orchestra meets both Monday & Wednesday 4:30-5:20. How are decisions made about who is accepted into the String Project? First year students will be accepted on a first-come-first-serve basis, with a total of 70-80 students in the beginning classes. All students who have been in the String Project for a year or more are encouraged to continue in the program, as long as they are participating in their school orchestra program. Any students who are already playing and would like to join the String Project for the first time should contact Dr. Becker (kbecker2@unl.edu). IN ORDER TO BE IN THE STRING PROJECT, ALL STUDENTS MUST BE PARTICIPATING IN THEIR SCHOOL STRING PROGRAM ONCE THEY ARE IN 4TH GRADE. We want your child to be a positive role model for the other students in his/her school orchestra once they are in fourth grade and we support the outstanding instruction provided to string students in LPS. Sep. 10 Orientation for FIRST YEAR STUDENTS ONLY, Rm. 116 (4:30-5:20 & 5:30-6:20) Both Parents and Students should attend! Note: Nov. 28 is the Fall Concert at Park Middle School. All classes on Nov. 28 will take place at 4:30PM, followed by a 6PM performance at Park Middle School. After the Nov. 28 concert classes will start up again on Jan. 16th (no classes between the Nov. 28th concert and the Jan. 16th classes). Note: April 15 is the Spring Concert in Kimball Recital Hall (UNL Campus). Classes that day are in Kimball Hall beginning at 5:30PM, followed by the concert at 7PM. Dottie Ladman has recently retired after 37 years of teaching public school music, the last 27 of which were in the Lincoln Public School system. She most recently taught at Maxey and Kloefkorn elementary schools and Lux middle school. She has also taught at Campbell, Norwood Park, McPhee, Saratoga, and Lakeview elementaries, and Pound Junior High in Lincoln, and at Unadilla Community School, Douglas Community School, and Bennett Elementary School. Dottie is principal violist with the Hastings Symphony Orchestra, and plays in the Lincoln Civic Orchestra. She earned her Bachelor of Music Education degree at Nebraska Wesleyan University in 1973 and her Master of Music degree from the University of Nebraska-Lincoln in 1997. After teaching band and vocal music eight years outside of Lincoln, staying home with small children for five years, and substitute teaching for three years, she became a "string specialist" by administrative decree (she could hold a viola so she must be able to teach strings, right?) Over the years she has honed her string teaching skills and become especially good at working with beginning and intermediate level students. She has had articles published in the American String Teacher magazine, Stringing Along NEASTA newsletter and the String Teachers’ Cookbook. Dottie’s viola teachers have been Morris Collier and Clark Potter, the latter of whom was most gracious in assisting in the removal of rust formed during seventeen years of not playing her instrument at all. Dottie has presented sessions at the Nebraska Music Educators Conference, ASTA National Convention, and for the Lincoln Public Schools music staff and UNL methods classes. Her orchestra has also performed at the Nebraska Music Educators Conference. In 2001 she was given an LPS Gold Star Award. She is a member of the National Association for Music Education and the American String Teachers Association. Dottie has two grown daughters, three precious grandchildren who are her pride and joy, and two cats to keep her company at home. Her hobbies are knitting, genealogy, and raising historic hybrid irises. 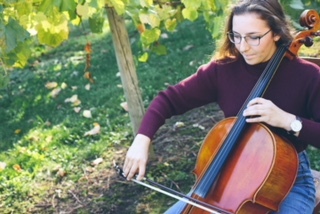 India Enter is a freshman cello performance major at the University of Nebraska where she studies with Dr. Karen Becker. She began playing cello over nine years ago and has taught privately for over two years. She has always been involved in her school orchestras, the high school dinner ensemble, and pit orchestra. India was also involved in many orchestras outside of school including the Minnesota All-State Orchestra in 2015, NAfME’s All-National Orchestra in 2016, the Canon Valley Youth Orchestras from 2010-2018, Minnesota Youth Symphony’s Repertory Orchestra in 2015, and the Owatonna Community Orchestra in 2017. In addition to orchestra involvement, India has participated in summer camps and chamber groups including ‘Bravo!’ in 2014 and 2015, ‘Stringwood’ in 2015, the Artaria Chamber Music School 2015-2016, and several other small groups with other high school peers. 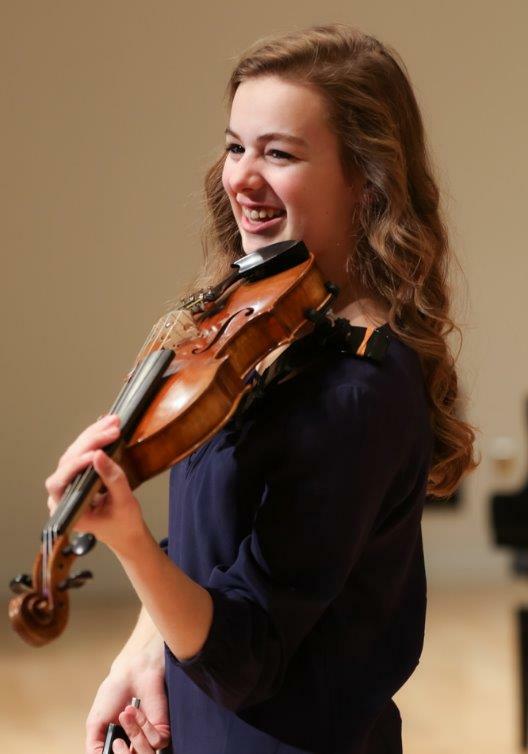 Victoria Hartley is a Sophomore Viola Performance major at UNL, under the private instruction of Clark Potter. Tori started learning the violin at age five after watching her mother play. After playing violin for nine years, her violin teacher moved to California and after much thought Tori switched her main instrument to viola. She played both violin and viola in the Omaha Area Youth Orchestras for six years and served as principal violist serval times. She is a three year All State musician and 2016 Nebraska All-State orchestra principle violist. She has also been involved in summer music festivals and camps including Ottawa Sound Encounters, Omaha Conservatory of Music Institute, and UNL Chamber Strings. Tori worked for four years as a teaching assistant for the Omaha Conservatory of Music’s String Sprouts Program. Through this she found her passion for teaching young string players. Aaron Jaapar is a violist and music education major and a native of Omaha, NE. He began learning the violin at the age of 8 through Omaha Public Schools and did not receive private instruction for almost a decade. Seven years later he decided he preferred the mellow sound of the viola. He eventually began studying both cello and double bass, but maintains the viola as his primary focus. His previous teachers include Danny Sabra, Dr. Mary Perkinson, Brian Sherwood, and Greg Clinton. He has participated in the OPS All-City Music Festival, the NMEA All-State Orchestra, and the Omaha Area Youth Orchestras. A versatile musician, Aaron has participated in many professional quartet, trio, and solo performances at weddings and other special events throughout the Omaha metro. Skilled on all four of the bowed string instruments, he has often performed professionally on violin, cello, and bass, in addition to the viola. Aside from performing, Aaron has also been an active educator teaching private violin, viola, and cello lessons, through his participation in Partners In Performance through UNO, and assisting with the Omaha Conservatory of Music "Sprouts" program. Patrick Knowles is a junior music education major at the University of Nebraska-Lincoln. Originally from Rapid City, South Dakota, he’s been playing the violin since the age of four through the Black Hills Suzuki School. In high school Patrick went to Allstate Orchestra for four years and actively lead, participated, and tutored in his school orchestras; he also had the privilege of traveling and performing in Europe, China, and Los Angeles on orchestra trips. His influence and motivation to teach music comes from two previous generations of music teachers in his family. Patrick is striving to teach in a public high school after he finishes his undergraduate degree, and perhaps become Suzuki certified. Christian Schuerman is currently a senior studying Music Education at the University of Nebraska- Lincoln. He graduated from Millard West High School in Omaha, Nebraska, Class of 2015. Mr. Schuerman performed with many different groups throughout his high school career, including orchestras, wind ensembles, choirs, chamber groups, jazz bands, show choir bands, and musical pit orchestras. He served as vice principal in Omaha Area Youth Orchestra’s Youth Symphony, in which he performed with the Omaha Symphony, as well as making All-State Orchestra for three years. He also received the Louis Armstrong and Woody Herman Jazz Awards. In college, Mr. Schuerman has played bass in Symphony Orchestra, Wind Ensemble, and Symphonic Band, and also plays tuba in the Cornhusker Marching Band, Big Red Express Pep Band, and Tuba-Euphonium Ensemble. Current affiliations of Mr. Schuerman’s include the National Association for Music Education, Nebraska Music Educators Association, American String Teacher’s Association, and Phi Mu Alpha Sinfonia Fraternity. 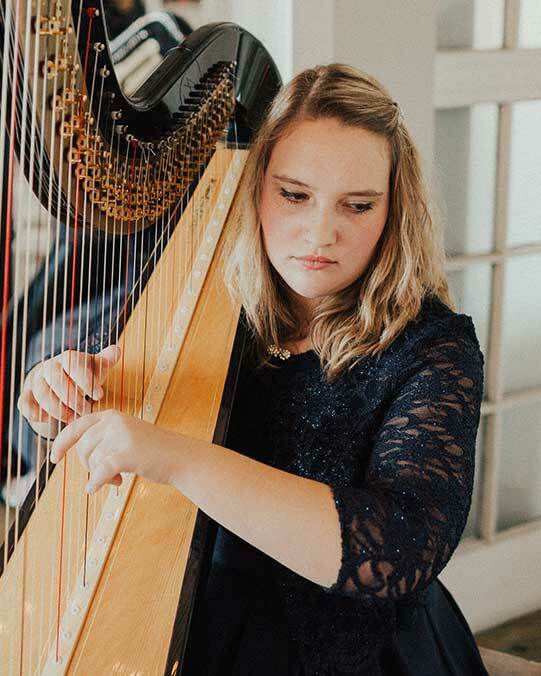 Melissa Srb is currently a senior music education major studying harp under Mary Bircher, at the University of Nebraska-Lincoln. Melissa has always been involved in music and started playing the harp in 4th grade. She graduated from Lincoln East high school in Lincoln, Nebraska. She was a member of the Lincoln Youth Symphony, a 3-year Nebraska All State Orchestra member, and played with America’s Honor Orchestra. Melissa has played with the Hastings Symphony Orchestra and Sioux City Symphony. She also teaches private lessons and gigs in the Nebraska/Iowa area. Melissa’s desire to become a teacher comes from having influential teachers throughout her music career. After graduation, she would like to teach elementary beginning strings. Jake Wheeler is a music education major at the University of Nebraska-Lincoln studying classical bass under Dr. Hans Sturm. He started playing the cello at age 10 and switched to the upright bass at age 14 and has loved the instrument ever since. Throughout high school he played with various orchestras, jazz groups, and chamber groups growing his love for music in his experiences. He is a lover of all kinds of music and gigs around the greater Kansas City area, where he is from. With the opportunity to teach with the String Project, he hopes to spread his love for music and provide his students the same opportunities he has been given. Karen Becker is Professor of Cello in the Glenn Korff School of Music at the University of Nebraska-Lincoln and director of the University of Nebraska and Lincoln Public Schools String Project. She also coaches chamber music and teaches Cello Pedagogy and Literature. Dr. Becker is an active soloist and avid chamber and orchestral player, serving as principal cellist of the Lincoln Symphony Orchestra and touring regularly both as a soloist and as cellist in the Concordia String Trio. She has performed throughout the United States as well as in Europe, Mexico and Puerto Rico. She is faculty artist with the Red Lodge Music Festival in Montana and the Omaha Conservatory of Music Institute, and often serves as faculty artist for the Ameropa Chamber Music Festival in Praque, Czech Republic. Becker has presented at numerous conferences, including international conferences of the College Music Society and national conferences of the American String Teachers Association (ASTA) in Kansas City, Atlanta, Providence, RI, Louisville, KY, and Salt Lake City, as well as the Midwest Band & Orchestra Clinic in Chicago. She has served as president of both the Nebraska and Missouri chapters of ASTA and has served on national committees. She has received the ASTA Citation for Leadership & Merit and the Private Studio Teacher Award from the Nebraska chapter. If your child wants to play the double bass we recommend contacting CGS Music, The Violin Shop or Palmer Music. If you would like to support a student registration and/or instrument rental.